If this setting is activated, the latest change will be added to the History. 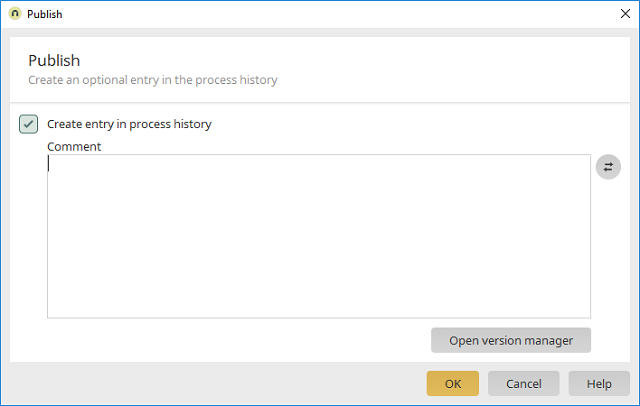 This setting is not available if the "Always create entry in history when publishing applications, processes or layouts" options is activated in the options in the portal properties. You can add a comment to document the latest change in the process. If a comment is not specified, the default comment from the language constant "COMMIT_DEFAULT_MESSAGE" in the default portal language used. Opens a dialog where the changes in the process can be tracked. Opens a dialog where the semantic version number can be edited.